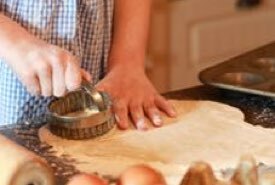 Grandma's old fashioned drop cookie recipes are very easy to make. They're called drop cookies simply because you make them by using a soft cookie dough that's dropped by spoonfuls onto a greased cookie sheet and baked. These old fashioned cookies are made using all-natural, wholesome ingredients, and they taste absolutely delicious. Everybody loves them. You simply can't beat the taste of homemade! 1 cup of molasses, 1/2 cup of butter, 1/2 cup of water or milk, 3 cups of flour, 2 tablespoons of sugar, 2 teaspoons of ginger, 1 teaspoon of clove, 1/2 teaspoon of soda. Mix and bake in a moderate oven. One cup shortening, 1 cup sugar, 2 eggs. 3 tablespoons sour milk, 1 cup chopped nuts, 1 teaspoon salt, 1/2 teaspoon soda, 1 teaspoon cinnamon, 1/2 teaspoon cloves, 2 cups flour, 2 cups natural bran. Cream butter, add sugar gradually, then beaten eggs, then milk in which soda has been dissolved, and dry ingredients mixed together. Add the nuts broken into quarters. Drop from a teaspoon on buttered baking sheets and bake in moderate oven. Two tablespoons butter, 1/2 cup honey (scant), 2 eggs, 1/4 to 1/2 teaspoon soda, 1/2 cup flour, 1 cup natural bran, 1/8 teaspoon powdered aniseed. Cream the honey and butter together. Add the eggs unbeaten, and beat the mixture thoroughly. Sift together the flour, soda, bran, and aniseed. Combine all the ingredients; drop from a teaspoon onto a buttered tin and bake in a moderate oven. 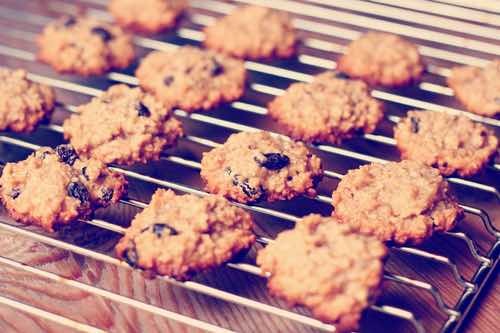 These old fashioned date drop cookies with the chewiness and flavor of the rolled oats and walnuts are so good tasting. And the raisin drop cookies are equally delicious. One half cup shortening, l cup sugar (either white or brown), 1 egg well beaten, 1/3 cup sour milk, 1-1/2 cups rolled oats, l cup chopped dates (can use 1 cup raisins also), 1/2 cup chopped walnuts, 1-1/2 cups sifted flour, sifted again with 1/2 teaspoon salt, 1/2 teaspoon soda, 1 teaspoon cinnamon, 1 teaspoon nutmeg, 1 teaspoon ginger. Sift together flour, soda, and salt. Set aside. Measure butter and sugar into large mixing bowl; beat until well blended and smooth. Add egg and vanilla flavoring; beat well. Add sifted dry ingredients; mix until combined. Stir in Rice Krispies cereal, chocolate chips, and raisins. Drop by level tablespoon onto lightly greased baking sheets. Bake in moderate oven (350°F) about 12 minutes or until lightly browned. Remove immediately from baking sheets; cool on wire racks. Makes about 3 dozen crunchy cookies, 2-1/2 inches diameter.